There are some people out there who’d readily agree that the words “Radiohead” and ukulele should never be uttered in the same sentence. Not so if you’re Amanda Palmer of The Dresden Dolls and Evelyn Evelyn fame. There was the potential for Palmer’s covers EP to be career suicide or simply oh-so-bad as diehard purists murmur things about sacred cows and masterpieces best left untouched but in her hands it is simply a collection reflecting her own effervescent personality – it’s full of theatrics, a DIY attitude and is brimming with creativity. It is fitting that this is also Palmer’s first release after a less than amicable split with her record label. She adopted a Radiohead-esque user-pays-what-they-like system (save the 84 cent donation to cover administrative costs like filling Radiohead and PayPal’s coffers). But ultimately Palmer is the one that’s laughing after selling $15,000 worth of merchandise in the first three minutes of sale, in what was a perfect way to stick it to the former label and celebrate her newfound freedom and independence. The EP boasts seven stripped back, twee pop covers. As the fifties “As seen on TV”-inspired title suggests, the offering is the hits of Radiohead with Palmer taking cuts from the group’s classic 90s albums from “Pablo Honey” through to “Kid A” and everything in between. Clocking in at around 32 minutes, it has a simple charm that sees Palmer enthusiastically bask in the creative process to the point where it all seems like one large art experiment. “Fake Plastic Trees” is a gentle and delicate story full of light strums and lyrics that are almost whispered, her voice sounding like it could melt the coldest of ice queens. Vocally this song sets the stage for the remainder of the release with Palmer’s delivery attempting to and occasionally being on par with Messer Yorke’s. “High and Dry” boasts some magical piano while “Exit Music (For A Film)” was performed live at the Sydney Opera House with a string quartet for accompaniment. “Creep” makes two appearances on here and was actually the song that spearheaded the record. Palmer originally learned it on the ukulele for some Iranian punk musicians (as you do) and the rest was history. The first version is a cover preformed at soundcheck in Berlin while she was hungover. Four bemused German stage technicians are the only spectators on hand and Palmer is said to have cried when she originally heard it (the song seeming to soar as high as her vocals reaching up to the heavens). The other version is a special digital-only bonus track performed in Prague with a group sing-along of sorts. 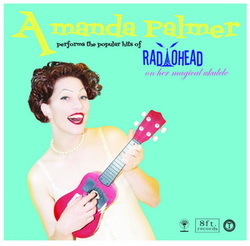 “Amanda Palmer Performs the Popular Hits of Radiohead” is a strange chameleon of a record that sees the enigmatic cabaret artiste performing what she loves in a manner she’s similarly fond of. None of the covers prove revelatory and some may even sound lacking but they’re ultimately different interpretations (to a degree) of the original, behemoth tracks. Cranking up the novelty factor and quirk to the max, the interesting ditties come across as sweet, a bit special and very theatrical. Basically, the release could be affectionately dubbed “Let Radiohead be naked by an adoring and kitsch fan”.